Major Medicaid managed-care reforms hand the ball to states. Will they run with it? Nearly 80% of Indiana's Medicaid population is enrolled in managed care under the Healthy Indiana Plan. 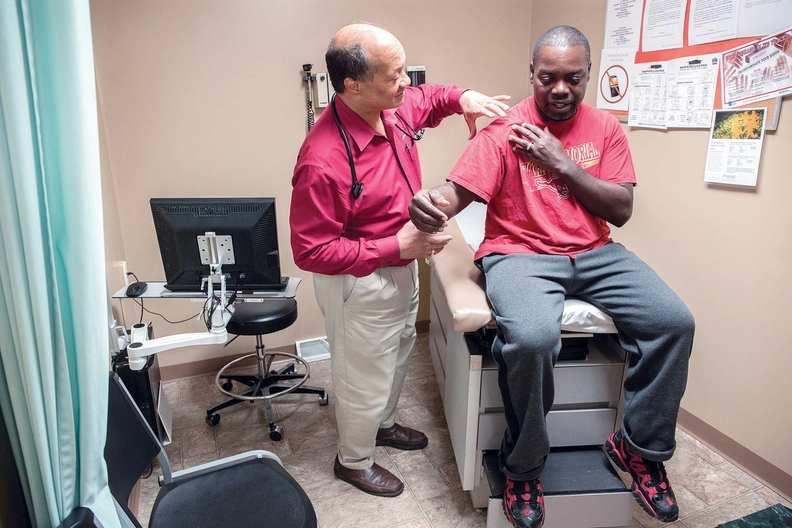 Above, Dr. James Jackson examines Rufus Keen, a HIP enrollee at the Heart City Health Center in Elkhart, Ind. The key word defining the first significant federal changes to Medicaid managed care in 14 years is “flexibility”—for states, that is. The CMS laid the responsibility of ensuring that some of the country's poorest residents receive timely, high-quality care to the 39 states and the District of Columbia that contract with private managed-care plans to provide Medicaid services. But those states will need money, manpower and some detailed direction to implement the provisions of the sweeping Medicaid managed-care rule. And some states are more prepared than others to meet the challenge. That could lead to disparities in the improvements to healthcare quality and access the regulations seek to achieve. The CMS did not change much from the proposals published last May. The agency outlined several major reforms, including installing a medical-loss ratio for insurers and provisions intended to make provider networks more robust. The goal is to ensure that a program meant to cut costs and constrain budgets doesn't lead to inadequate or unattainable care for the estimated 46 million low-income people enrolled in Medicaid managed-care plans. 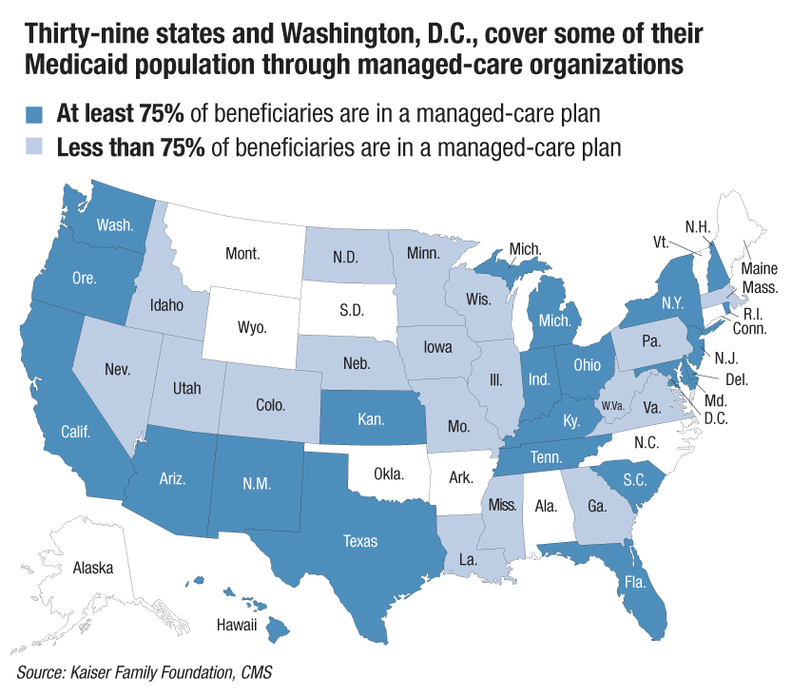 But it's up to cash-strapped states—many of which have refused to expand Medicaid eligibility under the Affordable Care Act and have severely cut Medicaid resources over the past several years—to take the CMS up on its policy suggestions. “You can't just sit back and think it's going to happen if (states) don't have the resources,” Solomon said. State programs are now responsible for ensuring the adequacy of provider networks, conducting more provider screenings and submitting more details for rate certifications. States will have varying levels of interest and ability to carry out reforms the feds left up to them in a 1,400-page final rule. Camille Dobson, deputy executive director of the National Association of States United for Aging and Disabilities, said states will implement the rule differently because their programs differ in their level of maturity and performance. The more successful ones already meet many of the new guidelines. Others will have to make substantial changes. In some states, that means having to hire more employees and develop new systems for collecting and analyzing data. This will be a particular challenge for states that are struggling with huge budget shortfalls for a variety of reasons, including a heavy reliance on oil tax revenue. States will now have to submit more details in their rate-certification packages, and they will have to deliver them earlier. Another burden on workload will be mandatory screening of providers. A number of states probably won't meet at least the first of the rule's deadlines because their state legislatures are not in session to discuss new funding. “We don't know how much teeth any of this has until states respond,” said Anil Shankar, a lawyer with Foley & Lardner who focuses on Medicaid. States hope the CMS will deliver guidance in a timely manner, but that is usually a challenge for the federal agency, said Dobson, who worked at the CMS for a decade focusing on Medicaid policy and operations. “The regulations always do leave a lot to be desired in terms of details,” she said. A linchpin of the regulation—the 85% medical-loss ratio standard—leaves states a significant amount of wiggle room. The CMS encourages states with no minimum MLRs to adopt the 85% floor when they are building capitated payment rates for insurers. That would increase efficiency, saving about $14 billion in federal and state funding from 2018 to 2020 if every state had the 85% MLR. Network adequacy also will require the perseverance of individual state Medicaid agencies. The CMS chose not to create quantitative network-adequacy standards in the rule and instead said states must develop their own time-and-distance standards for several types of providers. Those include OB-GYN, behavioral health, specialists and pediatric dental. Consumer groups cheered that the CMS is requiring states to do something to bolster provider networks. Many managed-care plans have been lambasted for restrictive and bare-bones networks that prevent Medicaid beneficiaries from quickly seeing a doctor. The final rule will at least prod plans to re-evaluate their provider relationships. The Obama administration made the same rationale in its February decision on the ACA's individual exchange plans, deferring to states to define network parameters. The major questions are whether and when states will do the grunt work. Most of the changes are supposed to go into effect the next time states award contracts to managed-care companies, putting many implementation dates into 2017 and 2018. “Some states are extremely meticulous and aggressive about it and are on top of the plans, and other states, not so much,” said Sarah Somers, an attorney at the National Health Law Program. Some experts and stakeholders, though, are more confident that states will take advantage of the rules and aggressively set new managed-care standards. “They have sort of struck a good middle ground in terms of giving some flexibility to states,” said John Corlett, executive director of the Center for Community Solutions, a nonpartisan think tank. Corlett previously was Ohio's Medicaid director and also worked at MetroHealth System, the public safety net hospital in Cleveland. “This gives states added ammunition in terms of negotiating with these plans (regarding) how they want these services provided,” he said. Matt Salo, executive director of the National Association of Medicaid Directors, said the many requirements have led states to say that they may need to hire up to 100 new employees. The timeline for implementation in the final rule, which will be officially published May 6, is more generous than the one in the proposed rule, but it's too early to say how realistic it is, Salo said.